Welcome back to what I am confident will be a year of growth and challenge for us all. This year we celebrate 100 years of Cubbing in South Africa, and as you will have seen we are doing so in style! We hope to see you all joining in as we celebrate a century of providing young people the opportunity to grow and become better citizens. If we engage with our fellow Scout and citizens in that spirit there is no doubt that we can be a force for good and true Messengers of Peace in our communities. And maybe, just maybe we can be part of starting a tide of change for the better in the country. 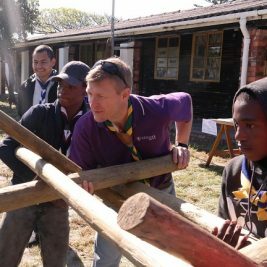 Difficult economic times also challenge the time and resources we are able to contribute to Scouting, both individually and as an organisation. Remember that we are a team that works together, our youth, our parents and guardians and Scouters. If you feel you are taking strain, talk to the Scouting people around you and share that load where you can. If we are to continue making the kind of difference we do in the lives of the youth of this country, we need to grow our resources and we cannot afford to lose anyone of our skilled and dedicated Scouters. Don’t underestimate the ability of our youth to assist if you give them the opportunity to lead, with your support.